Jakarta Council (DPRD) Vice Chairman, M. Taufik promoted Thousand Islands' potentials as popular tourist destination in Jakarta through his fishing activity.
" All sides should cooperate and be more optimal in exploring Thousand Islands' tourism potentials"
In this activity, Taufik was accompanied by Thousand Islands Regent, Husein Murad, some Non-Governmental Organizations (NGO) chairpersons, and media crews. "All sides should cooperate and be more optimal in exploring Thousand Islands' tourism potentials. For example to facilitate tourists who want to enjoy fishing trip aside from snorkeling and diving in Thousand Islands," he mentioned, Wednesday (4/10). Husein Murad, Thousand Island Regent explained, there are fishing spots in Thousand Islands such as in Panggang Island and Peniki Island. 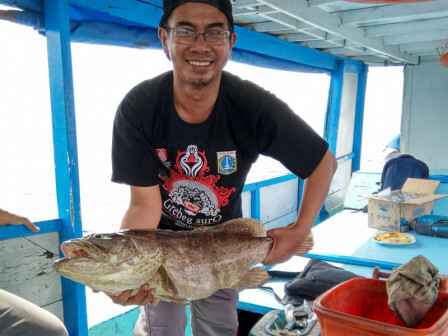 He mentioned that even amateur angler can get various fish such as crimson jobfish, tuna, emperor breams, rabbitfish, and grouper. "Visitors just need to rent fisherman between Rp 300-500 thousand a day based on the capacity," he added. Jakarta Public Service (JPS) Executive Director, Mohammad Syaiful Jihad stated, Thousand Island has many potentials for tourism sector, especially related with fishing, resort island, and water sports. "We just need to intensify the tourism promotion and socialization thus many people are interested to visit Thousand Islands," he added.